Good home cooked simple food, locally sourced wherever possible. The wee township is a safe outdoor play area built with play houses in the style of traditional Tiree Township. The children’s indoor play area is perfect for wet afternoons andis easily supervised from the tearoom with drawing & colouring tables, Tiree farm-yard, toys & books. At the Rural Centre you can purchase postcards, Tiree bird books, Tiree flower books, a nice range of Tiree Feis clothing, stationary & various other souvenirs. 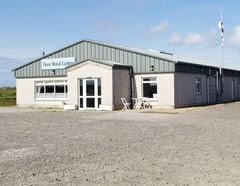 Broadband internet access vouchers can be purchased for use at the Rural Centre. Computers are available if you don’t have your own laptop. A great selection of books & DVDs, all about the land; Please come and browse at your leisure. A small fee is charged if you wish to remove items from the building.